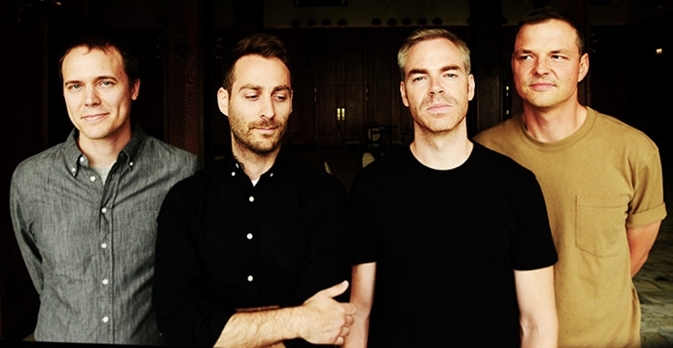 American Football's is something more than a long-awaited comeback: in 1999 the midwest emo cult band left its debut and masterpiece as a heritage, disappearing right after from the scene that saw them coming to life. It took seventeen years to hear the news of a reunion and a new album: after some practice show the band got on the road to meet the fans that, during the years, helped keeping their name alive, spreading those classic songs that even today sound like a fragile, heartfelt generational hymn for outsiders. Before the concert at Circolo Magnolia in Segrate (Milan), the only Italian date of the tour, we met Mike Kinsella and Steve Lamos to retrace the steps of a peculiar history, talking about their past and present as a band. The first time I heard your second album, since the very first notes I felt like I was coming back home from a long trip. Do you have a similar feeling, coming back on stage with your old and new songs? Mike: It feels very different than it used to: we’re now playing for a lot more people, it kind of feels like a whole new band. It’s fun to play in front of more people interested in it, before this we were doing it in his (Steve) living room, almost to nobody. Steve: Yeah, more fun this time! How was your first reunion show at the Pygmalion Festival in Champaign-Urbana? Mike: That was fun and exciting. That was the most nervous I’ve been. Steve: I wish we could do it again. It was fun but I don’t know how it sounded. (laughs) Before that we did a kind of a practice show in a bar, outside on a big stage… I was very nervous too, but it was great! The cover art with the house in Champaign-Urbana has become sort of an icon. I read that many young bands come to play there just to take a picture with the house in the background. In fact, isn’t it quite important for your music? – I mean as a place of intimacy where you can talk about yourself with complete honesty. Mike: I don’t know why we picked it: we liked it, and there’s our buddy, Chris, who took a bunch of photos. I don’t know what the logic was, but I liked that. Looking back, it all makes sense. Steve: To watch it evolve and watch people grab on to this idea of the house, it makes sense in retrospect but I don’t think it was conscious. Last night we were at a metal concert, and I was walking around looking at these people, with these shirts... I mean, I don’t know this world, the scary stuff and whatever, but there’s a theme to metal bands and I guess ours is the opposite of that. Steve: (pointing at my Slint cover t-shirt) I mean, that’s an icon, but why? Just a bunch of dorks goofing around, they’re young and they’re cute and they’re having fun. Did you ever just stop looking at it, wondering about its evocative power? Steve: I was never in it, I didn’t know where it was! Mike: It’s a small town so if you drive around you see it and you say: “Oh yeah, that’s the house”. Steve: Did you see that some kids have spray-painted the sidewalk? So they can take a picture from the same angle, like it’s a thing. Moreover, you offered a new angle on the 2nd LP. Mike: Like I said, the first time it was just a photo, we thought it could fit. And this time it was conscious, the same house but from a different perspective. Steve: And of all the pictures, the one inside was the most interesting, and then we started thinking about the lyrics, so they have a lot to do with when you have achieved what you think you wanted to achieve when you were younger. Mike: It was the same photographer, we asked him to go back to the house and shoot some pictures. This one was taken recently. When it comes to your music, of course there's a lot more to it than just a certain kind of lyrics and music styles: they're all equally relevant aspects, but for me it's always been especially a matter of "sentiment", because it really changes the whole perspective. Most of your lyrics, if you read them as they are, appear to be sad if not almost suicidal; but when you listen to the songs they become filled with the sweetest melancholy, in the end even hopeful. Is this the product of lyrics being added after writing instrumentals? Mike: Usually the songs exist finished or almost finished before the lyrics come about. The band has a style of music and I have a style of writing: also my solo stuff as Owen sounds like the prettiest music in the world and then, like, “I’ll kill myself” (sings mockingly), because if I just think of love songs I’ll just make them sappy, it’s too much, so I think they must have a little bite. Steve: But sometimes they’re funny! When I hear something that Mike says or his lyrics, if you take them literally they’re bizarre, but they’re not to be taken literally, it’s a little bit tongue-in-cheek. The point of all this is to be hopeful, my God! If not, what are you doing it for? You can talk about all kinds of things, but if you’re not listening to the music to somehow feel better, then what are you doing? Do something else! We still write the instrumental stuff first, you don’t come to this band with the lyrics and say “Hey, write music around it”, it’s always been the other way around. Mike: I think it’s an oversaturation for sure. I mean, it was cool and we were surprised that everyone listened to the record and cared and then we were excited to make all these interviews, but I think it’s maybe too much. If you followed our Facebook around the time when we put out the new album it was like “promo! promo! promo!”. I don’t follow our band’s website or anything because it’s too much. But that’s the only way you can stay relevant: every day you wake up and you have to remind people this is a thing. Did you feel it, during these years, that there was this kind of mythology growing up? Steve: Maybe you did, Mike, I certainly didn’t. Mike: Not to this level, not at all. I thought it was the same hundred kids that came to an Owen show. I had no idea it was spreading like this. Steve: I have to say that, doing the new music, I appreciate when other people appreciate that we’re trying to do some new things and keep it fresh, because we’re not going to do just the first album again and again. We did thirty reunion shows and we can’t do it, there’s no point in keeping on playing if we can’t do something else too. So, hopefully this helps, it feels more like a real band. A couple of years ago The Guardian published an article whose title was: "Emo, no longer rock music's dirtiest word", referring to a new generation of American bands like The Hotelier and TWIABP, who shifted from the pompous suicidal anthems of the Noughties to a punk-rock nostalgia inherited from the Nineties. You recently made fun of those "bloody" stereotypes with the not-so-serious video for "I've been so lost for so long". Do you think the term "emo" needs to be cleaned up, or it just shouldn't be a thing? And do you like what the younger bands are doing with (or without) it? Mike: I’d lean more towards not being a thing, but we don’t worry about it. If we did, we wouldn’t leave the house. It’s not like we get out there and be like: “Come on, we’re not an emo band”. Obviously we are at this point, so we don’t really think about it when we’re writing or doing anything musically. I played some shows with TWIABP: these sounds have always been in my wheelhouse, it’s like the stuff I grew up liking at twenty. I am a big fan of your songwriting project, Owen, and I think there has been a shift in the alt-rock/emo 90s scene to a more acoustic/songwriting style. Why did you decide to follow that path? Steve: You really hate band practice! Mike: It’s really just logistics, and then I was just getting married, so... I was still playing in other bands - I was playing with Joan of Arc at the time - but this is the easiest thing or what’s coming out of me right know. If I look back at your career as Owen, I feel like I have watched your life going on, like in a musical counterpart of the “Boyhood” movie. When you were looking for love in “At Home With Owen”, when you had a daughter in “Ghost Town” (my favourite Owen records)… What’s in store for the future? Mike: It gets a lot harder to write: it was easy when I was going out single, just being a lot more social, I turned that into songs pretty easy. But now it’s about making dinner every night, and then taking a hour and a half to put the kids to bed. If I wrote a song about the struggle of putting your kids to bed, there’s this tiny little audience that’s gonna be into that, and most of those guys don’t care or have the time to listen to music and buy records. So it’s tough, I have to either write more vague, or project a lot more out of myself. I’ll just go out and make up situations for people that I see, cause I’m not living them. American Football is a lot more fun than doing Owen stuff, I travel with my friends instead of driving by myself. So what’s next with the band? Mike: We’re excited to write new songs again. The only way to have it keep going is to keep writing new songs. We can’t just be nostalgic forever. Steve: And I think from the last album we learned some things we will do the same and some things we could do differently. Do you think you’ll be able to keep a faster pace than before, or will you just take the time you need? Mike: It will be sooner than 17 years, for sure. It’s already in progress. Steve: That last record was written in about two or three months and recorded in another six weeks - we had to, we had no choice. But I think now we have a better sense of what this new version is, because the first one wasn’t even supposed to be a thing - the fact that it existed is a minor miracle. This last one is really where we have learned how to be a band, so hopefully we’ll get there soon.